The Real Estate (Regulation & Development) Act, or RERA, would push up debt levels of real estate developers and lead to continued negative cashflows, say property developers and analysts. Companies in the BSE Realty Index had a combined debt of Rs 52,598 crore as of September 2016, about 7.3 per cent higher than a year ago. These companies had an average 0.8 times debt to their total equity in September 2016. The debt of top developers is expected to go up by 15-20 per cent in the current financial year, according to industry estimates. "RERA will definitely pose challenges for many developers in terms of cash flows. Many were launching without approvals and that fungibility of money will go away and some level of stress will come in," said Anita Arjundas, managing director and chief executive at Mahindra Lifespace Developers, part of Mahindra group. RERA makes it mandatory for developers to keep 70 per cent of the proceeds from a project in an escrow account, thereby restricting their ability to dip into project sale revenues. It also makes it mandatory for developers to obtain all approvals before launching any project, thereby prohibiting pre-launches, a favourite method of developers to raise funds to finance initial expenses for a project. Ajay Jain, executive director-investment banking & head, real estate group at Centrum Investment Banking, said that most of developers have to borrow project-by-project under RERA and slowdown in sales. "Earlier, they were able to complete any project with 50 per cent from sale proceeds. Now it has come down to 20-30 per cent. RERA will make matters worse," Jain said. Home sales have halved in major markets, such as Gurgaon, Noida, Mumbai and Bengaluru, in January to March this calendar year from a year ago, says property data analytics firm PropEquity. "Continued slump in sale of residential units will result in continued negative cash flows and push up the already high debt levels, resulting in the weakening of the sector's credit profile. The implementation of RERA will further impact liquidity," said India Ratings and Research in a recent report. 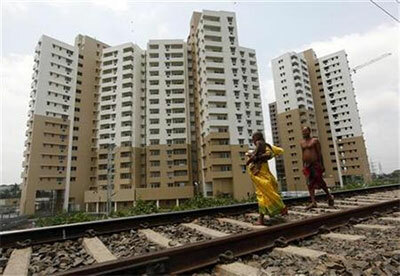 Rajeev Talwar, chief executive at DLF says property developers need to get accustomed to the new style of working. "Earlier, they were launching projects even without land. Now they have to buy land, get all approvals, and launch projects," Talwar said, adding tha DLF has worked out its cash flow planning and working on making the company debt-free. "We will launch only after completion," he claimed. DLF had debt of Rs 24,098 crore as on September 2016. "There has to be a financial recalibration as there will be gap between fund requirement and availability. Since nationalised banks do not fund for all purposes, property developers have to go for NBFCs (non-banking finance companies) and private equity funds," said Sandeep Runwal, director at Runwal group. Developers don't have the room to increase prices also given the slowdown in sales and unsold stock. Arjundas said developers would not be able to increase prices in the next six months due to high inventory levels and gradual pick up in demand. "I feel prices will hold steady or go up marginally in the near term," she said.